The South Bay chapter of a religious and political activist group was the victim of an alleged theft. 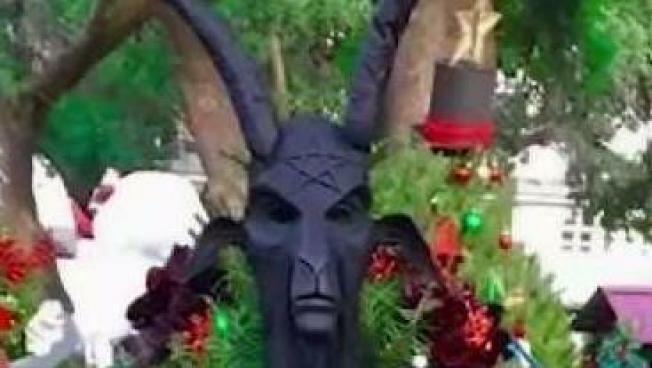 The Satanic Temple of San Jose erected a tree as part of the city's annual Christmas in the Park. However, someone reportedly stole the group's tree-topper, a Baphomet's Head, which is a goat head on a human body, according to Satanism. In response to inquiries on Facebook, officials with the Satanic Temple — a 4-year-old organization headquartered in Salem, Mass. — said, "Some Grinch stole it." The theft from tree lot No. 802 indicates that "people needed to show us Satanists that they couldn't tolerate our holiday spirit," they added. The South Bay chapter of a political activist group is the victim of a holiday scandal. Police have taken a report on the incident. The Satanic Temple said police asked if they wanted to file the incident as a hate crime, but the group declined. The Satanic Temple of San Jose's tree is located next to other trees from the Church of Jesus Christ of Latter Day Saints and other religious groups. Christmas in the Park organizers said as long as the displayers are not profance, everyone is welcome to participate. "Everyone is entitled to their opinion. And as a public organization and a public event, it's our responsibility to make sure everybody has the ability to voice their beliefs, said Joseph Schumaker with Christmas in the Park. "Thank you City of San Jose for hosting our holiday tree and welcoming us to our first year at San Jose's Christmas in the Park. Happy Holidays from The Satanic Temple-San Jose Chapter. Members of The Satanic Temple- San Jose Chapter wished to be represented in our local community this holiday season. In the spirit of pluralism and with the intention of strengthening our community ties, we reached out to Christmas in the Park and secured a Holiday tree for 2017. We anticipated the possibility of vandalism and/or theft, and while have no desire to encourage such poor behavior, decided a proper representation of our religion was worth the risk and used a beautiful hand crafted Baphomet mask as our tree topper. We have been made aware that our tree topper has been stolen. Understanding that this theft does not represent our community as a whole, TST-San Jose would like to move past this incident and continue to participate in the holiday festivities as part of the local community we value and love. We will be replacing our tree topper as we can, and hope you all enjoy our tree."